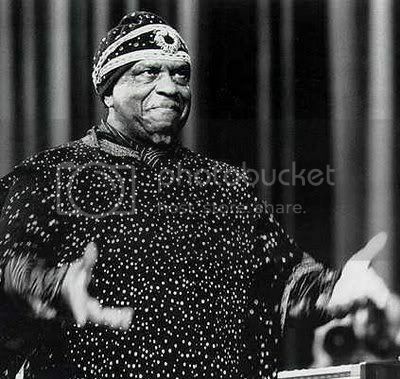 For the first time to be available are rare unreleased poetry written by and performed by Sun Ra and other band members. Most of the poetry is recited by Sun Ra with the addition of 3 performances by Ray Stubbs, a man with an incredible voice and Yochanan. It is also interesting to hear early versions of poems Sun Ra and June Tyson would recite during concerts. This volume covers poetry from 1957 to 1966. Volume 2 consists of poetry recitations by Sun Ra. Starting the CD begins with poetry from 1975 in a medley of poems. A large segment of this disc was recorded in Philadelphia exposing the energy and thoughts Sun Ra had and put into words. The wisdom of this poetry is important because it touches on many aspects Sunny would express during concerts. This volume covers poetry from 1966 to 1982. Volume 3 begins with 2 extended works from an unknown poet. The poems deal from an alien’s point of view and how he views the planet earth. The first piece displays the alien from an anger perspective. The second piece examines the alien’s coming to terms point of view based around describing how it is to live on his planet. Next, this disc presents 2 poetry recitations with the first being recited by Wisteria (June Holden), John Gilmore and James Jacson. The second version of this poem presents June Tyson and Sun Ra reciting. The last 4 poems come from 1982 as part of a one hour body of work.